Carrying your baby around is the best thing we can possibly do to be closer to them. But sometimes, our hands need to be free in order to do something, like it's easy to hold onto something when your hands aren't full. I'd like to use my arms and hands at the same time while I'm carrying my child. And I'm thankful for this baby sling invention that makes things even better. Carrying your child is no longer a hassle. Hands free I must say. Today, I have an opportunity to review another kind of baby sling carrier Offered by C&A Commerce. I purchase the item online, and my transaction went very smooth and the next thing I know, the product is in right in front on our doorstep. Ships fast, especially when you take the advantage of the free shipping and fast. I see no signs of damage in the packaging box that I was able to open and use the baby sling carrier right away. This product is amazing, very unique and the design is way exquisite and different. The packaging is good, I see no signs of damage in the item, however the manual that comes with the merchandise seems to be crumpled indeed look like it's been used by someone else. 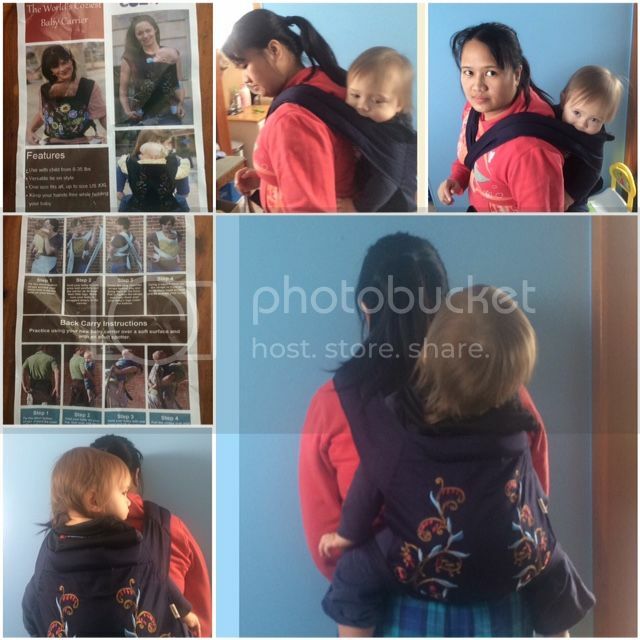 I like the outside design of the sling and how you can use it on the back too. It would be very handy for someone who carries a child, especially when they are at the back. But, I have a problem using the sling when I tried the back ways. As shown in the in the manual, I followed the step by step figure, yet it seems to be very impossible to do it all by myself without the assistance of my husband. I'm very careful not to drop my 13 months old who seems to be moving non-stop. And then it took me 15 minutes to make sure I did the right thing, and when things are all tight up and secure. My son was finally in the baby sling carrier. It looks like he is very comfortable. However, I have noticed again that the waist portion where it helps hold the baby seems to feel loosening. I'm quite concerned, yet at as the time I used the sling, it never did happen. The fabric feels sturdy and sewed very well. It feels softer too. The straps are also long enough to use. I have given a 4 star rating for this product because of some aspects that I am not satisfied with. Maybe it works perfectly for you, these are all my experiences and opinion. For the List Price of $28.95, it is now dropping to the Price of $16.49 which saves you $12.46 (43%). I would recommend this product to those who are seeking for a nice, simple baby sling and want to make sure that the quality of the product is great. I love that there's an option for it to be put on your back and not just the front. Perfect! I wish I had a baby sling when my kids were little. That's a nice looking one.